In small bowl, stir cream cheese and powdered sugar until smooth. Set aside. 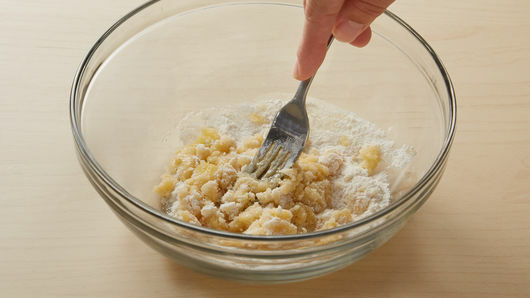 In another small bowl, using fork or pastry blender, mix melted butter, 4 tablespoons of the flour and the granulated sugar until mixture looks like coarse crumbs. Set aside. Separate dough into 8 rolls. Place remaining 1 tablespoon flour off to the side, on work surface. Dip cinnamon-coated side of each roll into flour; shake off excess. With cinnamon side up, press each roll into 3 1/2-inch round. 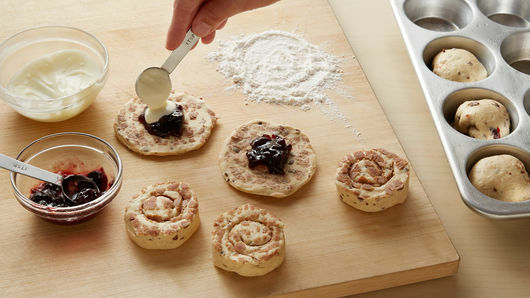 Spoon 1 teaspoon of the preserves in center of each roll; top with 1 rounded teaspoon of the cream cheese mixture. Bring edges of each roll up over filling; pinch edges tightly to seal. 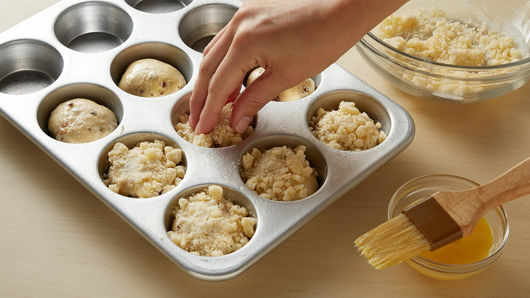 Place rolls, pinched side down, in muffin cups. In small bowl, beat egg and water with fork. Brush egg mixture over top of each roll. Sprinkle 1 rounded tablespoon of the crumb topping on each roll; slightly press into dough. Bake 16 to 18 minutes or until golden brown. Cool in pan 5 minutes. Remove cake bombs from pan; place on cooling rack. Place icing from can into 1-quart resealable food-storage plastic bag; cut small hole in bottom corner of bag. Squeeze bag to drizzle icing over cake bombs. Let stand 5 minutes. Serve warm. Crumb cakes and babka loaded with crumbs are popular desserts in my family. We all agree that the sweet, crunchy crumb topping is the best part of any baked good that is lucky enough to have it on top. These crumb-loaded treats come from generations of European bakeries, and remind me of what my ancestors might have enjoyed in the “Old Country” as a special treat on rare occasions or celebrations. Growing up, we also treated ourselves to baked goods on special occasions. It was not uncommon to meet my aunt or mom in the kitchen late at night, stealing a few crumbs off the top of the cake. The next day there would be noticeably fewer crumbs, and some guilty looks on everyone’s faces. It is so important to me to carry on the old traditions and introduce those freshly baked flavors and textures to my kids. I do this by filling the house with the smells, sounds and baked goods from the past. I don’t always have the time or energy to create time-intensive, complicated baked goods, so I have come up with some shortcuts that are similar to the old-fashioned treats, but with a modern feel and preparation. I love sharing these updated crumb-topped goodies with my family. My kids have even enjoyed making the goodies themselves, now that they are very fast and simple. 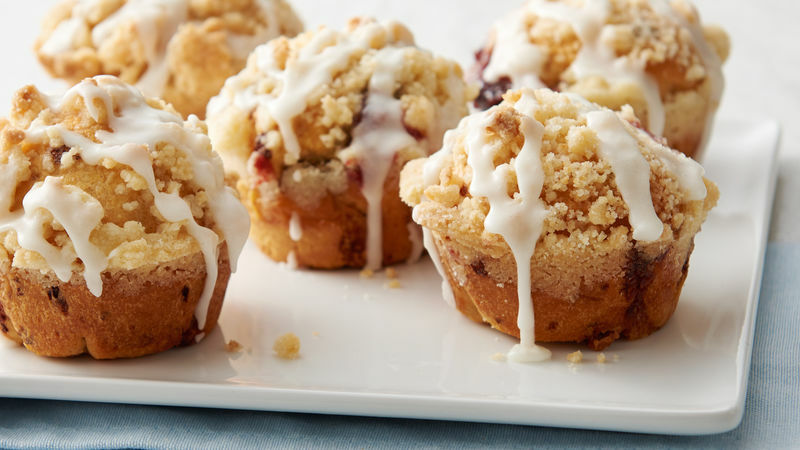 Thanks to Pillsbury™, the hard work of making the pastry is done, and I get to just focus on making memories and connecting my children to our heritage. I am proud to encourage a new generation of crumb topping lovers!